The enemy steps up the use of mortars and drones. 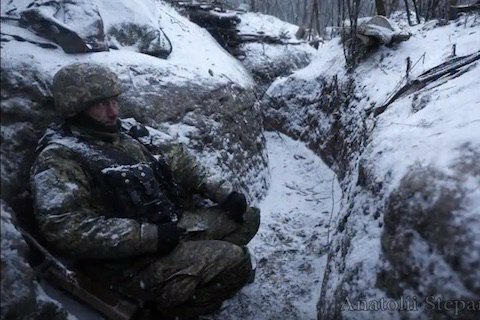 Four Ukrainian servicemen have been killed and two wounded in combat amid 28 attacks by pro-Russian militants in Donbas over the past 24 hours, the antiterrorist operation (ATO) HQ reported in its morning update on Facebook on 9 December. "The situation in the ATO area has escalated. The Russian occupying troops carry out deliberate and targeted fire on the positions of the Ukrainian Armed Forces and increasingly more often use mortars of various calibres banned by the Minsk agreements. The enemy's nighttime shooting activity has not subsided," the HQ said. In the Luhansk sector, militants used infantry weapons and 120-mm mortars, having fired over 50 bombs. They targeted Katerynivka, Novooleksandrivka and Krymske with 82-mm mortars and grenade launchers, Zolote with small arms and grenade launchers, and Luhanske and Zaytseve with infantry weapons. In the Donetsk sectors, militants fired with mortars and infantry weapons near Vodyane, in the Sea of Azov coastal areas, the Butivka mine, on the outskirts of Avdiyivka. A sniper was active near Kamyanka. Enemy drones banned by the Minsk agreements were spotted near Vodyane, Avdiyivka, Travneve, Siverske and Stanytsya Luhanska.